The only proper Russian major manufacturer, car maker and, later, warplane-maker, was Russo-Balt (or Russo-Baltique), founded in 1903 at Riga, then the industrial center of Imperial Russia, with German and Russian private funds. This was at first a subsidiary of the German Company Van der Zypen & Charlier based in Cologne and known in 1874 as the “Russo-Baltic wagon Factory”. Cars were built from 1909 at the railway car factory RBVZ, until 1915 when the company was evacuated near Moscow (after the revolution taking the name of BTAZ.). 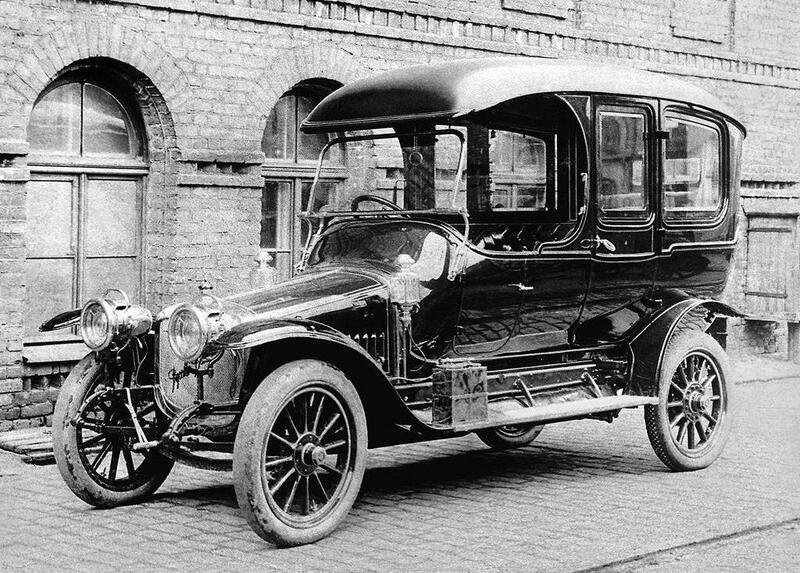 By 1909 the company launched the 24-30 and later the Type C, which was declined in many variants. 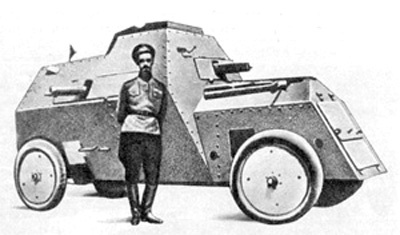 This was a reliable model which was chosen, due to its availability, to create one of the first Russian armored cars before the war, in 1912. 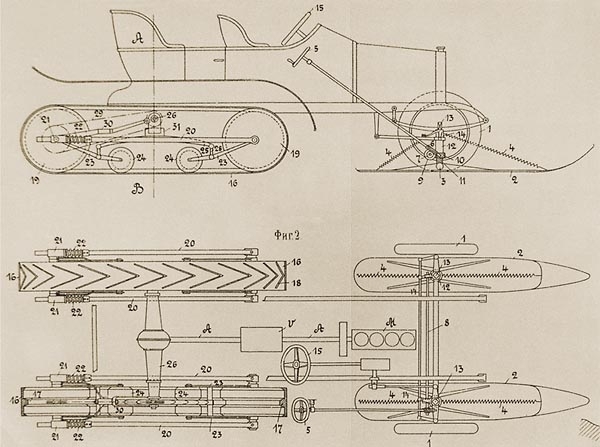 It is possible that engineer Dobzhansky supervised the conversion or what was the appearance of the 1912 model. 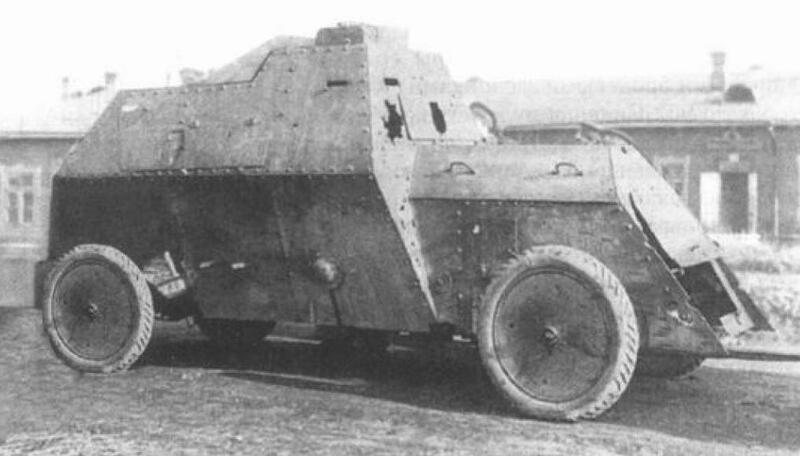 However, by September 1914, the preliminary design of the armored car Type C was done by Dobzhansky and the Captain of the Staff Corps of Naval Architects, AY Grauen. It was originally a four-seat S24/40 (series XIII-bis), keeping only the front ones, the rear being covered with a fighting platform. The sides were covered with sloped riveted plates (possibly boiler plates) around a steel frame. The driver sat on the left, seeing through a small sight slit. At his right was seated the co-driver, manning one of the machine-guns. It was in a semi-fixed position protruding from a folding panel pierced in the center. At the rear plate there was another one, centered, and two side panels with apparently slightly offset machine-guns to allow the two machine-gunner to fire simultaneously from each side. These panels allowed some traverse. There was a small storage box above the driver/co-driver’s seats, and a large double articulated hatch on the fighting compartment top. This was the only access to the car. Due to the lower height of the fighting compartment, it is likely that the gunners sat too, possibly on leather straps. Despite the lack of a turret, these four ports allowed to cover almost 360 degrees. Due to the cramped interior its more likely that only two or three machine-guns were manned at the same time, and one (possibly the side one) repositioned on another port if needed. At first only eight vehicles were converted, on the N°530, 532 (? ), 533, 534, 535, 538, 539, and 542 chassis completed by early October 1914, possibly the “Type C”. 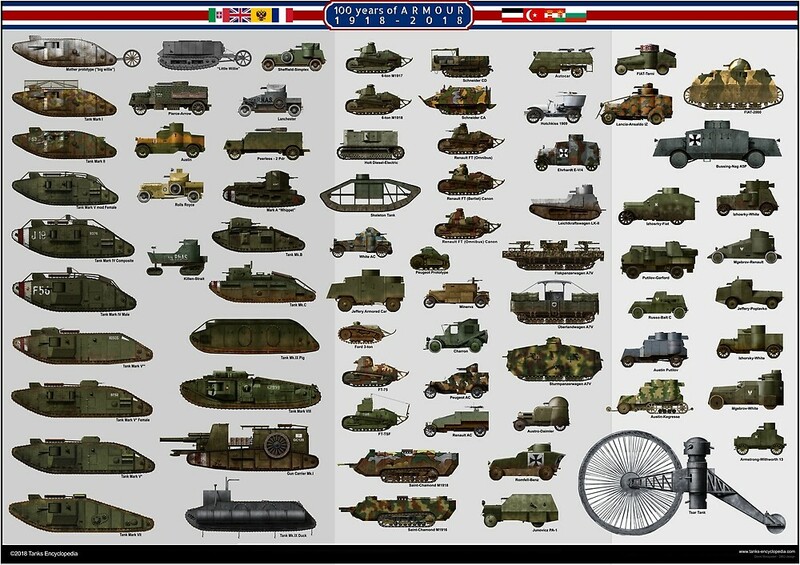 Little is known about the beginning of the vehicles, which were apparently formed into the very first Russian armored unit in operation. 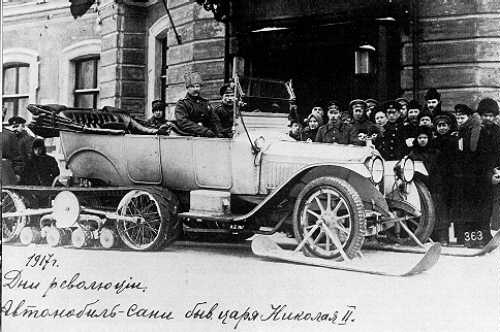 During the fall of 1914, the Russian automobile corp composed of 15 Russo-Balt and several Putilov-Garford trucks. 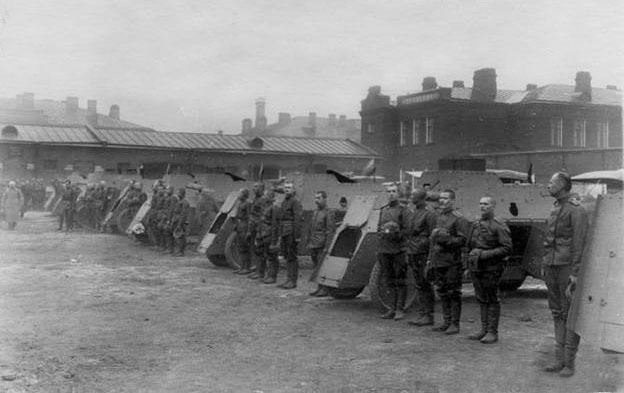 These were split into small detachments counting two Russo-Balts and one Putilov-Garford for gun support. 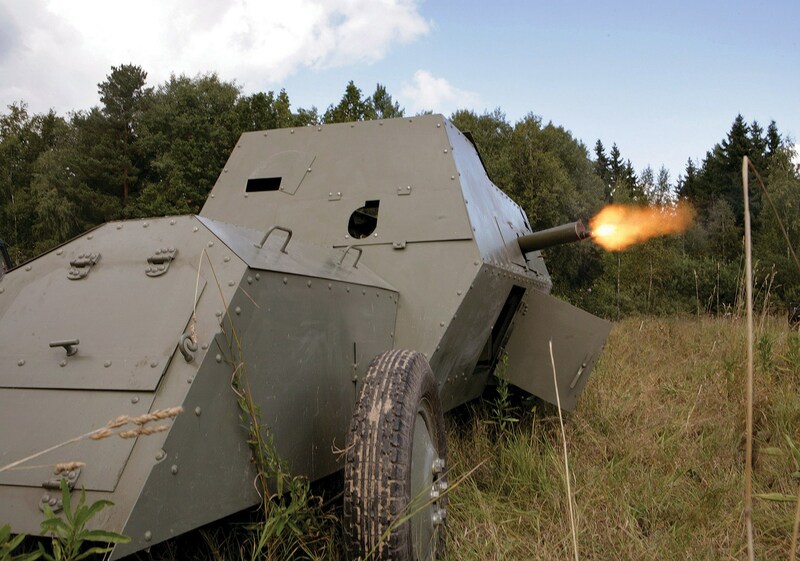 They were highly successful and led to many other armored car conversions, for more similar units, from 1915 to 1917. The fate of these vehicle is unknown. Other variants of the vehicle were the C24-30 series half-track, used for reconnaissance and ambulance, and a heavy-duty AA version of the T40-65 truck with a lendera-Ternavskogo QF 37 mm (1.46 in) gun. The vehicle was unarmored, equipped with large folding side pedestal legs and was assisted by a M24-40 supply carrier. Russo Balt C in Russian service, 1915. 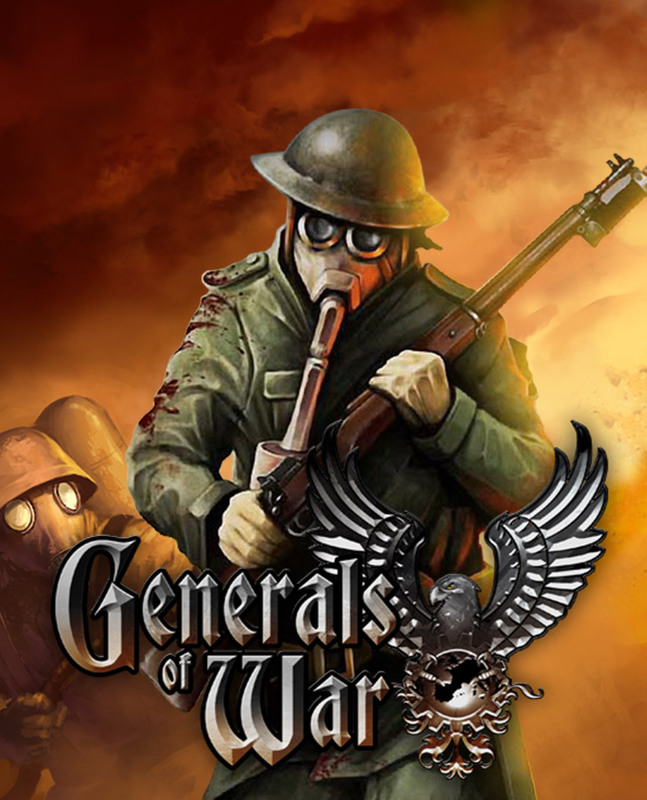 A modern reconstruction in action.